Russell Brand on Twitter, Phillip Schofield on Twitter, Dave Gorman on Twitter, even Andi Peters on Twitter - UK celebrity Twitter usage explodes! According to Hitwise web UK use of Twitter increased by 974% between Dec 07 and Dec 08 (does not include Twitter use through applications like Twhirl or Tweetdeck). However, I think this figure will pale into insignificance when the Jan 08 vs Jan 09 UK Twitter figures are released. I recently wrote about how Twitter has entered the UK mainstream and detailed some of the newspaper coverage it has had. Over the last week though UK Twitter coverage has gone through the roof - Jonathan Ross had a discussion about Twitter with Stephen Fry on his TV chat show, Phillip Schofield had a discussion about Twitter with Fern on This Morning and Stephen Fry has appeared all over the place eulogising about micro-blogging and his Twitter friends. 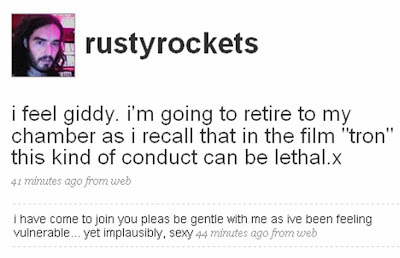 Russell Brand under the username @rustyrockets has started Twittering. Jonathan Ross verified this with a Twitpic here and a link to the Russell Brand Twitter ID. 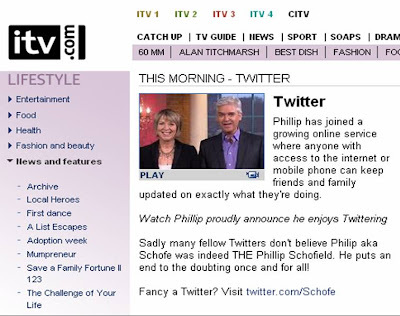 Under the Twitter ID @schofe, UK daytime TV legend and all round TV nice guy, Phillip Schofield, has started Twittering. Gaining over 9,000 followers in just a few days, Phillip Schofield verified that this is really him by linking back from his official website and talking about his Twitter ID on national daytime TV! Googlewhack celebrity and random adventurer Dave Gorman has long had an internet presence, but has also only just joined Twitter - using the ID @dave_gorman. Starting with an initial 'not understanding what I'm supposed to do here' tweet, Dave Gorman is now Twittering with @replies and by his own admission 'using the mobile web for the first time.' Looking forward to following him - and trying to picture how messy it would have been if he'd Twittered whilst trying to meet 54 other people called Dave Gorman! Writer Danny Wallace has also joined Twitter, again thanks to Jonathan Ross (who verified that this was the real Danny Wallace). 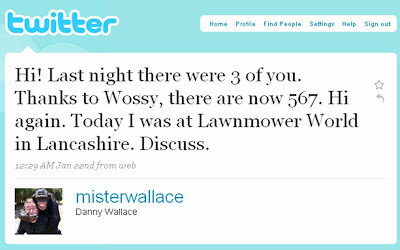 Author of Yes Man (the book turned into a film with Jim Carey), accidental cult founder and potential dictator of his own country, Danny Wallace has taken to Twitter to share his experiences of Lawnmower World, Roadchef and hanging out in bars with the Mighty Boosh. There are a wide range of other UK celebrities with Twitter accounts with the most notable being @Stephen Fry, @John Cleese, @Alan Carr, @andy_murray, @WillCarling, and of course, the now infamous, Jonathan Ross / @Wossy. Unlike Facebook (which requires your 'friend request' to be accepted before content is shared), the appeal of Twitter is the abiility to follow anyone you like, without needing permission to do so. The more celebrities that take to Twitter, the faster it will grow as a service in the UK - especially if, like all the celebrities listed in this post, they are prepared to post 'celebrity tweets' and use Twitter personally. I have been inundated with follow notifications so far this year (more in the last 3 weeks than I had in my first 18 months on Twitter) and every time Twitter is mentioned on a TV show / in the press, membership seems to grow ever larger! 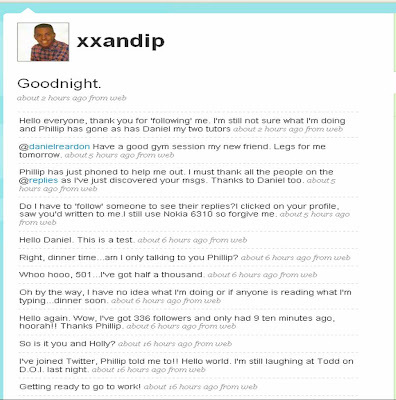 I think Twitter is just going to get bigger and bigger and bigger. However, whilst I see Twitter as complementary to Facebook, if Twitter keeps evolving then I think it could even start to impact / start to supersede IM, email and traditional ways of accessing social networks. Watch this space, it could just be the start of Twitter adoption in the UK! Britney Spears on Twitter and following me! Nic - that's the most brilliant round-up of UK Twitter 'Slebs! Good spots, especially Dave Gorman and Danny Wallace. I'm amazed by just how many celebrities have taken to it in recent weeks. I love the clip from This Morning and think it's nice that the UK celebs seem to be Twittering for themselves - especially the way that they seem to be responding to others and engaging followers in conversation. Now when's Bruce Forsythe going to join?! You can embed it if you view the source code and copy it - I created a simple tool for getting the embed code for iPlayer videos. 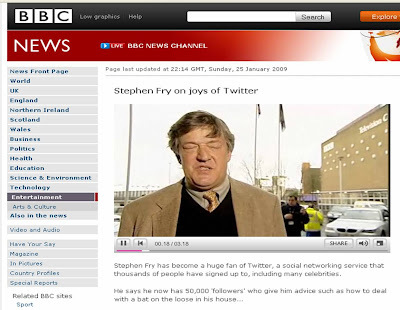 Not sure if posting it here will work but the code for the Stephen Fry clip is in a text file Fry Embed - I might adapt the tool for news clips as well.